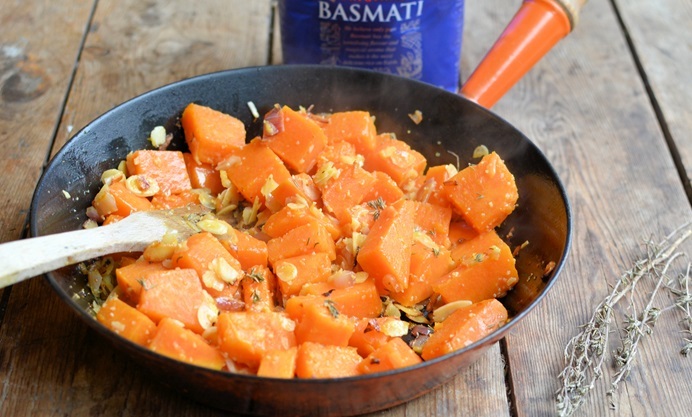 Karen Burns-Booth serves up a pumpkin and basmati rice bake recipe, the perfect midweek meal for a chilly evening. 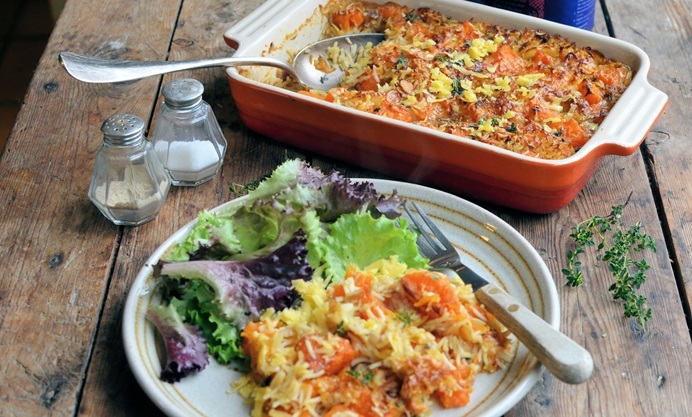 Time to think out of the box (or the rice packet) with this recipe – it uses fragrant basmati rice, but it’s not a biryani or a curry, or a kheema, nor is it any other spicy or curried recipe; it’s a baked rice dish with seasonal pumpkin, shallots, almonds and mature cheddar cheese, and it’s an easy one pot dish too, and is pure winter comfort food. 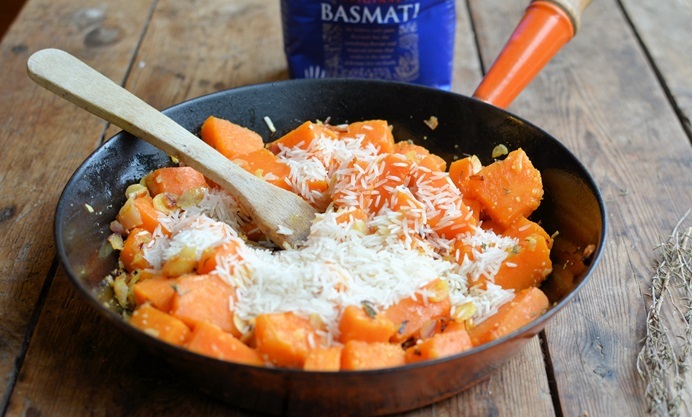 All you have to do is sauté the shallots with the pumpkin and almonds before adding basmati rice and some vegetable stock, then pop it all in to a gratin dish, scatter some grated cheese over the top and bake it for 40–45 minutes before serving it with a crunchy side salad, and maybe some crusty bread if the hungry hoards want some extra carbs! 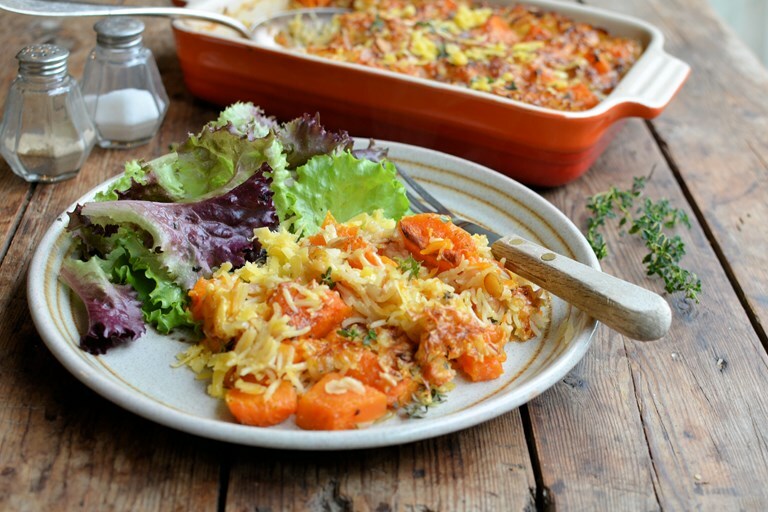 I love this simple baked rice dish, and you can use butternut squash if pumpkin is not available, as well as using any cheese that you may have lurking in the fridge! I love a good mature farmhouse cheddar, but I’ve also used an old-style Gouda cheese before too, and it added a wonderful nuttiness to the overall taste and flavours. You can assemble the whole dish the night before (or in the morning) before you need to bake it – in fact if you do this, the cooking time will be reduced by 5–10 minutes, as the rice will have been soaking in the stock – this means you can come home from work and have supper on the table in under an hour, making it a very forgiving recipe for a mid-week family meal. 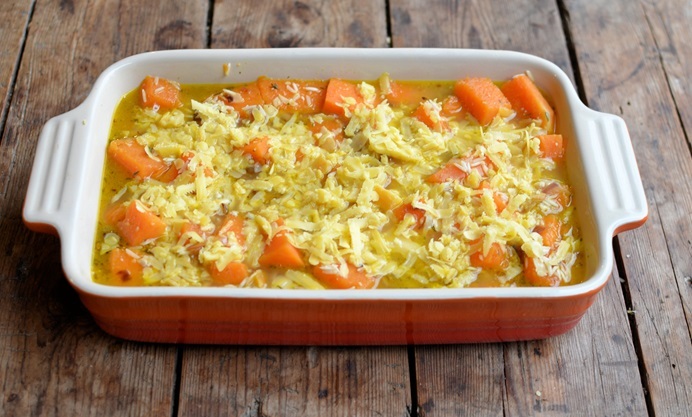 To bake, spoon the mixture into a large gratin dish and scatter over ¾ of the grated cheese, cover with foil and bake the oven for 20 minutes.